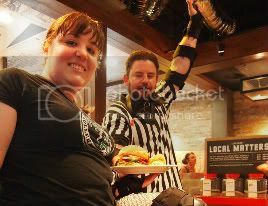 This month WA Roller Derby is in Grill’d Claremont Quarter’s Local Matters program. The deal is that Grill’d has $500 to give away. Each time you get a burger you will be invited to put a token in one of three jars, each corresponding to a local not-for-profit organisation. At the end of the month the organisation with the most tokens will receive $300, the second most will get $200 and third will receive $100. It’s all very technical but some of our skaters popped in to sample the burgers and can attest to their being both delicious and served with a smile. Get down to Grill’d Claremont Quarter in February and make sure you place a vote for your local derby girls.